The Dussek family – like the Benda family – has a long history as professional musicians, stretching from Jan’s grandfather until the 1970s. Jan’s mother was an harpist and this explains why he wrote so much music for that instrument. He commenced his studies in Bohemia, then moved to the Netherlands and Germany, where he may have studied with CPE Bach. For a time he lived in St Petersburg where he was a favourite of Catherine the Great. He subsequently was music director for Prince Antoni Radziwill in Lithuania and travelled as a virtuoso on both piano and glass harmonica. In France he was favoured by Marie Antoinette and on the outbreak of revolution he escaped to London with the wife of composer Jean–Baptiste Krumpholtz, who was an harpsit, and he drowned himself in the Seine. Dussek continued his career as a virtuoso in the English capital, where he received praise from Haydn, and set up a publishing form with Domenico Corri which went bankrupt and Dussek dumped Madame Krumpholtz in favour of Corri's young daughter, Sophia, whom he married. Amongst other things, Sophia Dussek was an harpist! After the bankruptcy Dussek retruend to Germany, leaving his family behind and his father-in-law in a debtor's jail. Returning to the concert platform it is said that Dussek was the first pianist to turn the piano sideways on the stage "so that the ladies could admire his handsome profile." He returned to Paris, in 1807, in the employ of Talleyrand, who was widely regarded as one of the most versatile and influential diplomats in European history. Dussek spent the remainder of his life performing, teaching and composing. His personal beauty fading and becaming grossly fat, eventually being unable to reach the piano keyboard, he developed a fondness for strong drink which hastened his death. He wrote 34 Piano Sonatas, a number of Piano Concertos and Violin Sonatas. He loved picturesque titles and his sonata for piano, violin, cello and percussion is called The Naval Battle and Total Defeat of the Dutch by Admiral Duncan (1797). A strange title indeed and the work is also one of the very rare examples of pre–20th century chamber music to include percussion. The huge four movement Sonata in F minor, L’Invocation, is Dussek’s final Piano Sonata. It is a bold and imposing statement, full of virtuoso writing for the keyboard and the language is dramatic and, quite often, forceful, but the end is quite and subdued. This Sonata points the way into the romantic era, still some twenty years hence, and it sounds remarkably modern because of its strength and construction. The three Sonatas from opus 9 are simpler pieces – the first and last in only two movements and the middle one in three. The second Sonata has an hair–raising barnstorming finale which never lets go, once it’s grabbed you by the throat! In his most informative notes in the booklet - although I wish he wouldn’t use the word namely so often - Lorenz Luyken gives the history of these sonatas and their publication in Paris, during Dussek’s first sojourn there, and the change of instrument from clavecin to fortepiano. It’s a fascinating essay and an interesting story in its own right. Whichever instrument they were written for they work perfectly well on a modern concert grand. Markus Becker gives strong and very musical performances of all these works. His use of light and shade is most impressive, colouring the music and aiding the romantic outlook of the music. He makes no concessions for the earlier Sonatas, treating them with the same virtuoso approach as the later work – surely they cannot ever have been given this way in the French parlours of the late 18th century! But his approach suits the music for it is bold and forthright. The recording is bright with the piano well forward and the cover of the booklet displays François Boucher’s Landscape Near Beauvais (1740). 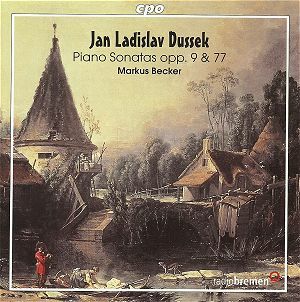 This is music well worth investigating and if Dussek is the missing link between the classical and romantic periods we should be looking at him more closely. This disk is a good step in that direction.